After Alexander Zverev gave his racquet eight good whacks on the court, an Aussie Open commentator said, “That should loosen him up.” One thing’s for sure: it loosened the racquet up. 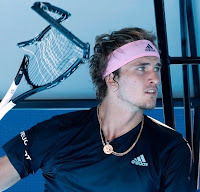 Did they force him to continue playing with that racquet? As with most star athletes, you have to add petulant along with talented. And I got the order right.